NEW YORK (TheStreet) -- The social media activity at Retrophin (RTRX - Get Report) has been placed on lockdown following questionable tweets penned by CEO Martin Shkreli and the discovery that employees were using alias Twitter accounts -- two of which affected the persona of gangster rappers -- to promote Retrophin and pitch short-sale recommendations of other stocks to followers. Retrophin's stock price has been cut in half since April, partly due a broader selloff in biotech stocks, but also because investors are losing confidence in Shkreli's ability to lead the young company as it tries to simultaneously develop new drugs for rare, genetic diseases and re-invigorate sales of older drugs obtained through licenses and acquisitions. The company's Twitter problem may not rise to the level of an Enron-like corporate scandal, but it's a frustrating distraction for investors waiting for Shkreli to deliver on promises made. Retrophin reports second-quarter earning on Tuesday. Expectations are high because the company has already raised revenue guidance for this year and 2015 three times since April. On Friday, Retrophin shares closed at $12.31. Despite falling from a high of $23 in April, Retrophin is still up 54% for the year. Shkreli did not respond to a request for comment. 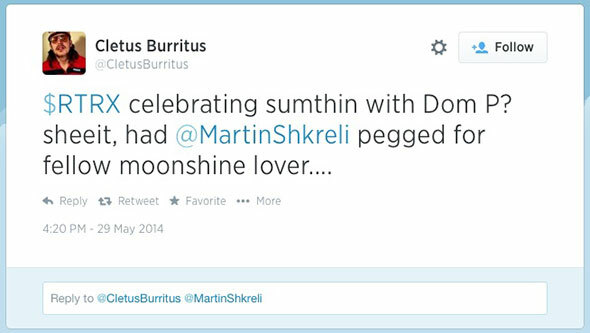 In June, Retrophin's board of directors instructed Shkreli to clean up tweets sent from his personal Twitter account. Shkreli was also told to cut back on tweets about the company, according to people familiar with the situation. The board took action following two Shkreli tweets on May 29, which seemed to offer a hint to his Twitter followers about a Retrophin acquisition of an approved drug from a private Texas-based company announced hours later. 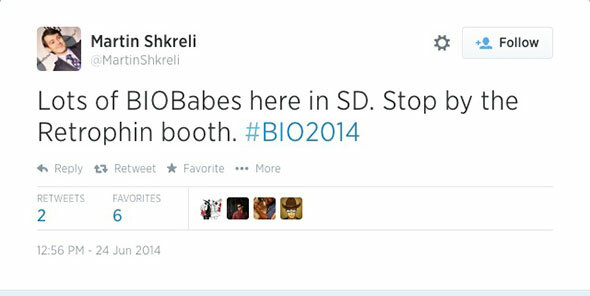 Retrophin's board was also angered by a Shkreli tweet in June in which he invited "BIOBabes" to stop by the company's booth at a biotech industry convention. More recently, three alias Twitter accounts were found to be under the control of unidentified Retrophin employees, according to people familiar with the situation. The link was found after the IP address of one of the alias Twitter accounts matched the IP address of Retrophin's headquarters. The most prolific of these accounts, @Thug_BioAnalyst, tweeted in "ghetto slang" expressing support for Retrophin and calling out other drug stocks, including TherapeuticsMD (TXMD, as shorts. 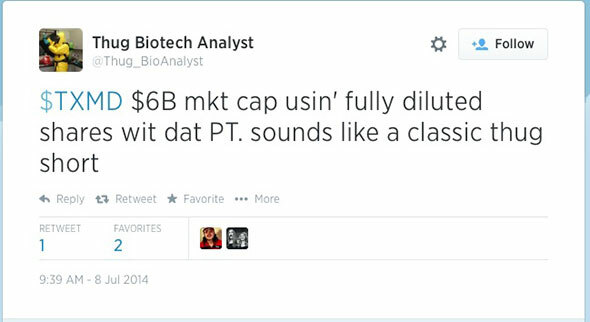 Two additional alias Twitter accounts -- @legitbiotech and @cletus_burritus -- parroted the "Thug" tweets. The discovery of the three alias Twitter accounts run by Retrophin employees compelled one large shareholder to lodge a complaint with Shkreli, urging him to put an end to the social media mischief. Tweets from all three accounts stopped on July 8, and the @cletus_burritus account was deleted entirely last week. "Martin impressed me with his ambition and his knowledge of drug development, which is why I am invested in the company," said another Retrophin shareholder who asked not be identified by name. "But then you see him selling [Retrophin] stock, missing deadlines and now this unprofessional Twitter stuff and it gets frustrating. You start to question if he's mature enough to run the company." Shkreli purchased numerous blocks of Retrophin shares in the open market during March, April and May. Investors viewed the CEO's purchases as a signal of confidence and it contributed to the stock's fast rise. But at the end of May, Shkreli surprised -- and angered -- his shareholders by selling almost $4.5 million in company stock at an average price of $15 per share. Retrophin' stock price dropped further following Shkreli's sale and has yet to fully recover. Health care investor Loncar views Retrophin's second-quarter earnings report on Tuesday as an important test of Shkreli's leadership and vision for the company. In May, Retrophin raised revenue guidance for 2014 to between $30 million to $35 million and $60 million to $70 million in 2015. This was the third time Retrophin upped its financial outlook since acquiring Manchester Pharmaceuticals and its approved drug Chenodal in March. Since then, Retrophin has also acquired U.S. commercial rights to another drug, Theola, from Mission Pharmacal. Late last year, Retrophin purchased Syntocinon nasal spray from Novartis (NVS, promising to reintroduce the already approved drug (a form of oxcytocin) to the U.S. market and jumpstart new clinical trials in schizophrenia and autism. So far, Retrophin's plans for Syntocinon have been delayed. And investors are waiting to see if Retrophin can begin a Phase III study of RE-034 in infantile spasms by the end of the third quarter, as promised. Shkreli has been on his best Twitter behavior since being slapped on the wrist by his board in June. If Retrophin can post strong financial results Tuesday and demonstrate progress on the development of new drugs, the latest embarrassing social media episode involving gangster rapping Twitter aliases will be forgiven.